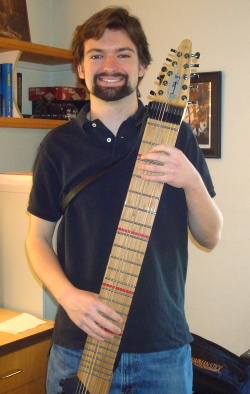 I ordered a 10-string Stick® (serial #5986) in October 2010 from Stick Enterprises and I received my instrument in February 2011. Soon after, I looked up the instrument on the Internet and found the beloved videos of Greg Howard demonstrating the instrument ("Video #1" and "Video #2" ;); I was sold. I couldn't believe how much music came out of the instrument. When 2005 came, I was lucky enough to attend the NAMM Show in Anaheim. This just happened to be the only time recently that Stick Enterprises was there, with a large booth. I finally had the opportunity to try one. I also got to see Greg Howard (among other professionals) in person. So, it's about 6 years later and now I have the means to acquire such an instrument. When you order an instrument from Stick Enterprises, you get to choose the wood that the instrument will be made out of, the fret inlays, etc: it's all custom. It was a pleasure to do business with Stick Enterprises; the craftsmanship of my instrument is just superb. 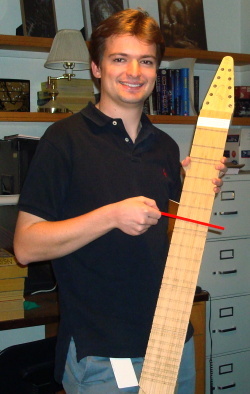 I can really feel the precision of the Fret Rails™ on the hard bamboo. The red "Trademark Linear Fretboard Markers" and smokey gray tuners contrast nicely with the body. The tone from the standard Stickup™ emits a constant excellence from the extreme down-fret on the lowest bass string to the extreme up-fret on the highest melody string. In the few months that I've had the instrument, I have already had a lot of fun playing on it and figuring out how to translate some various tunes from different musical worlds (ie. bluegrass' "Foggy Mountain Breakdown" or surf rock's "Apache"). I believe that my musical aspirations can be independently-achieved with the Stick. As a strings guy, this is the closest that I'm going to come to having the melodic power of the organ.